Luxury living at its finest w/ absolutely amazing Avila beach to Point Sal ocean views from this updated 3/3 home in Shell/ Pismo Beach. Whether watching sunsets on one of the decks, cozying up by one of the 3 fireplaces or entertaining in the back patio, this home has it all. Upon entering you will notice the high ceilings, the nice and bright feel and the hardwood floors. Plenty of space for a family or guests with both living room and family room that is open to the gorgeous updated kitchen including granite countertops, subway tile back splash, stainless steel appliances, soft close white cabinets, pull out drawers, Lazy Susan and pantry. You will love the sunroom /Breakfast nook right off of the kitchen with a French door that leads to a tiled and professionally landscaped backyard patio. 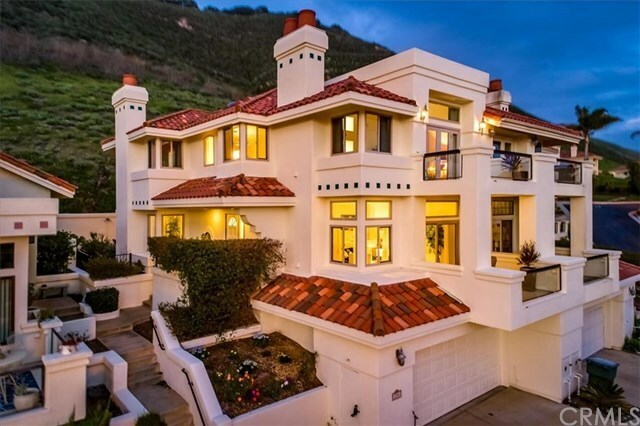 Step up the gorgeous staircase with cathedral ceilings, a modern chandelier & corner nook w/ built ins & views to reach the bedrooms including a gorgeous master suite w/ double doors, sweeping ocean views, fireplace, large deck & tons of windows to soak it all in. The master bath has modern finishes, marble countertops, beautiful tiled walk in shower, skylights, walk in closet and towel warmer. Plenty of room for cars and toys with this extra large two car garage with storage. Whether living here full-time or using it as a vacation home your luxury lifestyle awaits. Located close to shopping, restaurants, walking trails and just around the corner from the beautiful Pacific Ocean.